I met Martha at the Center Eau Claire and knew her first as the creator of the world’s most delicious toffee. It is buttery and rich, sweet and more than a little addicting. However, she is also a funny and thoughtful soul with much wisdom to share. I am grateful to share most Tuesday mornings in silent group meditation with her. She has a beautiful presence and I am so thankful she agreed to sit down with me one recent sunny morning to talk about glimpsing our spirit. Have you always been a seeker Martha? As far back as I can recall, I have had spiritual curiosity and experiences, but when I was fourteen my mother died. That catapulted me on very definite spiritual trajectory. My father had passed away when I was four. These deep losses created a difficult but rich inner life. One is compelled to ask the big questions when faced with such profound loss. These experiences, while difficult, crack us wide open to the realm of spirituality. So, much of my spiritual focus has been psychological work surrounding abandonment issues. Children process grief much differently than adults. If you ask my adult intellect if I am worthy, it says, “Oh HELL yeah!” The belief I internalized early in life, however, was “I’m not worth sticking around for.” So, the work is to bring that belief into conscious awareness and shed the light of truth on it. These damaging beliefs we carry can be rooted very deeply in our bodies and psyches. What was the path like for you? Well (laughing), I am very much still on it! I think it has been a real search to be free of discomfort. This discomfort has manifested in depression for me at times in my life, and it can feel like there is weight holding me back from joy. Within the realm of popular spirituality, there is great emphasis on staying positive, on being grateful, loving and joyful. While I do appreciate the value of cultivating those attitudes and energies, we DO need to acknowledge our negative emotions. I absolutely love the teaching of Matt Kahn that helps us “Love what arises.” He teaches us, for example, to “Love the one who is broken-hearted.” “Love the one who is frustrated.” So powerful! What practices or wisdom has helped you? I have a voracious appetite for the realms of spirituality, science and neuropsych. There is so much wisdom, old and new, and there are so many effective practices. I never tire of exploring! I know you have spent many years working with individuals with autism. How has your work shown you joy? My current work involves toffee-making, and there is definitely joy to found in it! Just last night I found some samples in my fridge at home and had a piece, and just said, “Wow!” My intention was/is to make joy in candy form. My son Mike and I developed the recipe over several years, trying to come up with the perfect blend of ingredients. When I make it now, I stir using the infinity symbol and put a special blessing of joy into each batch. You have two grown children. How did you find spirituality in motherhood? My own Mom had been a superb mother. She had a degree in child psychology from Madison. As I raised my boys I found myself resting in the lovely parenting she had done with me. It was so internalized and I think that ease is a form of spirituality. I was able to rest in who I was as a mother with a natural confidence. I remember, when my boys were little, often engaging with a tremendous sense of awe at these great big souls or beings in such little bodies. I have found much wonder in the fact that they came here with unique personalities from the get go. 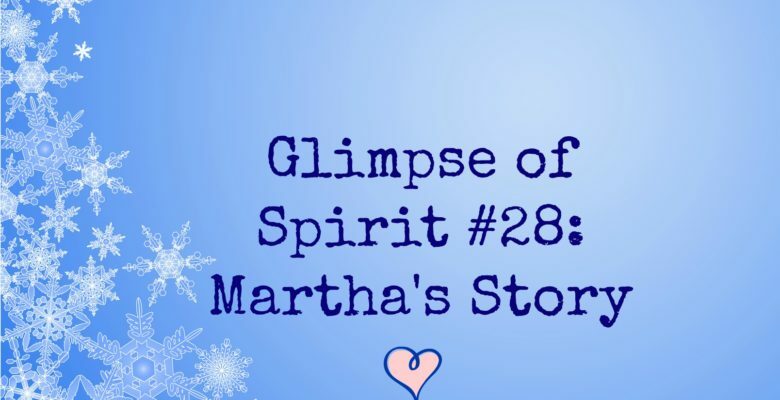 Where do you find spirit Martha? Have you gone deep enough to find the blessing of your early life? Yes- although I can’t honestly say I have yet transmuted it into joyfulness. The loss of my parents gave me great compassion. It gave me patience to do the work I ended up doing with people who have autism. Being brought to my knees at such an early age gave me instant humility and compassion. We choose what to do with our trials. We get to make the choice to allow them to be our teachers. When I was fourteen, shortly after my mother died from a long and grueling illness with breast cancer, I went to a park near my home and made a vow. I vowed that I would not allow my soul to become bitter from the loss of my mother. I just knew even then that it was going to be a defining experience of my life and I could not let it turn me ugly inside. It was a conscious choice to take a different path at that time. I look back kind of in awe at my younger self. Meditation is innate. We are all meditators. Children will stare at things until they become abstract, and repeat words and get that same effect. They might stare at themselves in the mirror and repeatedly ask, “Who am I?” Kids do these things. We enter altered states this way. These basic practices help to calm us also. I guess as adults, we just do it more purposefully. In my thirties I began to practice a Korean style of sitting Zen meditation. I had amazing teachers and experienced the results of weekend-long silent retreats. That experience showed me that there is a peace and non-attachment that is attainable and sustainable in this lifetime. I know it is accessible even though I do not live there every day. Not yet! There is wonderful research going on with meditation. Complex stuff. A topic for another interview, maybe! The simplest answer to your questions is, the more I practice, the better my quality of life becomes. What are your thoughts about an afterlife? I can’t wait to find out! Don’t get me wrong, I love life and want to stay here, fully engaged, for a long time, but a part of me has never been all that comfortable on this planet. I have asked, “Can I go home now?” I used to be a little embarrassed by that feeling, but I do not think I am alone in it. Whatever it is, I really do feel and sense that it is a better place. I sense it from loved ones who have passed. Maybe it will be nothingness, but I think it will be an adventure, and hopefully there will be toffee! Thank you Martha for such honest and beautiful sharing. I am grateful for you.